Appearing originally on the Solid Groove label out of Croydon in South London, Exclusively is sometimes misconstrued as the UK issue of Dance Hall Style. The tracks from both were recorded at the same sessions - with Bullwackie joined at the controls by Junior Delahaye and Prince Douglas - and issued close together in 1982-83, Croydon first. 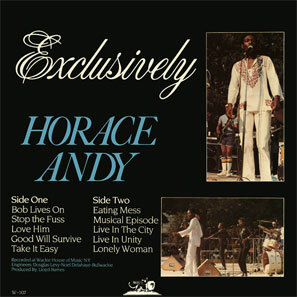 Half of Exclusively non-exclusively versions four tracks from the Stateside release - three are re-titled - and also Eating Mess, which appeared on the first pressing of Dance Hall Style, though unlisted on the sleeve. The mixes are all different (and without dubs). Five further specials include the funky Musical Episode, a superior Bob Marley tribute, and a version of Rougher Yet. 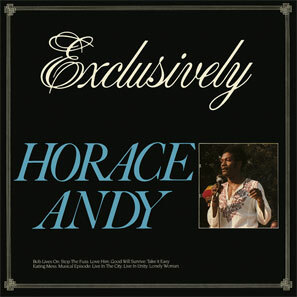 It's all vintage Wackies, and - spun out of Horace's all-time greatest album - unmissable.